스페이스원은 카롤라 다이에와 엘리스 게일 피니의 두 개의 개인전을 진행한다. 설치, 비디오 및 퍼포먼스로 이루어지는 이번 전시는 두 작가의 새로운 작업으로 구성된다. 카롤라 다이에는 이번 작업을 통해서 지방 민속 문화를 동시대의 맥락 안에서 재발견 한다. ‘A Stable Matter' 에서 다이에는 'topping-out performance' (상량식 퍼포먼스) 의 요소를 이용해 서울을 기반으로 작업하는 퍼포먼스 작가 유재인과 한옥을 연구하는 대목장 조전환과 새로운 의식을 형성한다. 안정과 영원한 부를 기원하는 독일과 한국의 ‘집-개막식’ 이 이루어진다. 엘리스 게일 피니는 주위에서 발견할 수 있는 물질에 대한 연구를 한다. 손과 목소리가 매체가 되어, 촉각과 청각을 통해 물질의 잠재력을 탐구한다. 이번 작업 'Close Attention' 에서 게일 피니는 지난 이 년간 해온 작업의 핵심 주제를 내포하는 두 개의 영상과 바닥에 놓여진 조각을 선보인다. Knowledge Based on Physical Touch (2014) ‘HairWashCarWash’ 프로젝트를 6개월 동안 진행하는 과정에서 만들어졌다. 퍼포먼스 작가와 미용사를 대상으로 여러 워크샵과 세차장 방문을 하며 쓸고, 씻는 행위를 통해 사람들이 그들의 육체적 경험을 표현하는 여러가지 방법에 대한 관찰을 한다. New Morning Practice (2014): 촉감과 인식 (현재 순간에 현존하는), 즉 이 작업의 맥락에서는 우주적인 행동으로 재해석 되는 것을 말한다. Collection (2015): 세차장을 하는 사람들이 구체적인 목적을 갖고 동일한 오브젝트를 대안으로 재활용하는 과정에서 시작한다. 이 또한 '쓸기' 를 하나의 결과적 행위로 관찰한다. Space One announces a two – part solo exhibition by Alice Gale-Feeny and Carola Deye. This exhibition brings new and recent works of the two artists in the form of installation, video and performance. Carola Deye's artwork often revisits rural culture and folklore in a contemporary context. 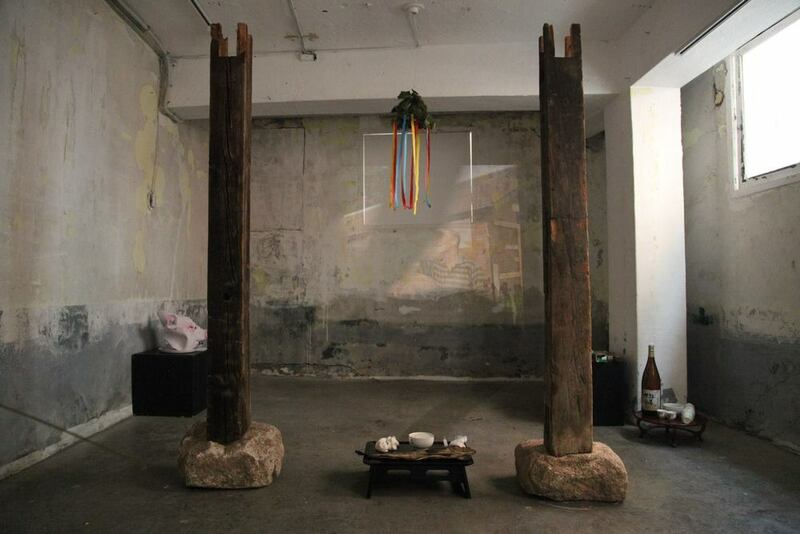 For 'A Stable Matter' she uses elements of her former “topping-out performance” and creates - in collaboration with Jane Yoo and Cho Jeon-Hwan– a new ceremony about German and Korean house-inauguration rituals, the longing for stability and eternal prosperity. Alice Gale-Feeny deals with the materials that are around her. By placing a focus on the hands and voice to act as mediators, physical touch and improvised speech are used to explore the potential in objects. For ‘Close Attention’, the artist presents two videos and a floor-based sculpture that incorporate key themes within her practice over the last two years. 'Knowledge Based on Physical Touch' (2014) was made during a 6-month long project entitled ‘HairWashCarWash’ which involved workshops with performers, hairdressers and site visits to a hand car wash. These workshops used activities such as sweeping and washing to see how a group of people may articulate their physical experience in different ways. 'New Morning Practice' (2014) touches on the artist’s interest in tactility and mindfulness (being present to the unfolding moment), which in the context of this work, is translated into a universal action. 'Collection' (2015) is inspired by the ways in which hand car wash attendants re-use existing objects, for specific, alternative purposes. It also looks again at the act of sweeping, thinking about it as the aftermath of an activity. 카롤라 다이에는 현재 국립현대미술관에서 운영하는 고양 레지던시 입주 작가이다. 독일 Mainz, 그리고 영국 런던에서 페인팅을 공부하고 1999년 부터 함부르크에서 거주하며 언더 그라운드와 CALL안에서 여럿 아티스트 그룹 친구들 그리고 러버들과 활동하고 있다. 다이에는Studienstiftung des Deutschen Volkes, DAAD, Hamburger Arbeitsstipendium, and Goldbekhof-Studio Hamburg 에서 학자로 활동했으며, 함부르크, 베를린, 프랑크푸르트, 레이캬비크, 파리, 그리고 히취리히 등에서 여러 전시에 참여했다. 엘리스 게일 피니는 영국 노팅험에서 거주하며, One Thoresby Street의 맴버이다. 최근 프로젝트는 아트 카운슬 지원 '그라운드' 2015; '선스크린' La Biennale di Venezia, 베니스, 이태리, 2015; 'The Drawing Board Residency' 노팅험 2015;‘Playing with Space’ 런던 등 여러 지역에서 전시를 했으며 ‘HairWashCarWash’ (개인전), Two Queens Gallery, (아트 카운슬 지원, 2014) 등 활발하게 활동하고 있다. Carola Deye (b. 1974 Oldenburg, Germany) is currently an exchange artist at MMCA Residency Goyang. She studied Fine Art Painting in Mainz, Germany and in London, UK. Since 1999 she has lived in Hamburg, where she is involved in the artist groups, Friends and Lovers in Underground and CALL. Deye was a scholar of Studienstiftung des Deutschen Volkes, DAAD, Hamburger Arbeitsstipendium, and Goldbekhof-Studio Hamburg. Recent exhibitions have been held in Hamburg, Berlin, Frankfurt, Paris, Reykjavik, and Zurich. Alice Gale-Feeny (b. 1989 Brighton, UK) lives and works in Nottingham, UK and is a member of One Thoresby Street. Recent projects include: ‘Ground’, co-curated with Oliver Tirre, ATTIC, One Thoresby Street, Nottingham, supported by Arts Council England, 2015; ‘Sun-Screen’ (online project curated by Candice Jacobs), in assoc. with EM15 at La Biennale di Venezia, Venice, Italy, 2015; The Drawing Board Residency (curated by Michael Pinchbeck), Primary, Nottingham, 2015; ‘Playing with Space’ (touring screening curated by Lawrence Bradby), Live Art Development Agency, London, Firstsite, Colchester, Norwich Arts Centre, The Maltings and Newbridge Projects, Berwick-Upon-Tweed, 2015; ‘HairWashCarWash’ (solo), Two Queens Gallery, Leicester, supported by Arts Council England, 2014 and New Artist Moving Image (screening) , Zabludowicz Collection, London, 2014.